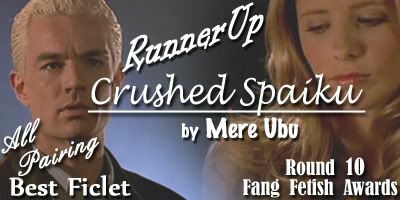 Improbably enough, Crushed Spaiku snagged runner-up for Best Ficlet over at the Fang Fetish Awards. This is my first fic award, and I'm tickled to bits to be in such good company. Congrats to all the winners! Whoever designed this did a lovely job. It's perfect and I heart it! Hope everyone had a great weekend and that Monday treats you well. I've been in bed with the Cold That Would Not Die for a full week now but hope to venture forth from the land of chicken soup and popsicles very soon. And dude! I have also had the Cold That Would Not Die for a week! You should have been in bed with me! This is so made of awesome that I'm just gonna fall over! *flump* Not the cold thing, but the a-ward! And look how pretty and appropriate to your subject matter it is! Very, very deserved, m'dear. I can't wait to go check you out on JustRewards.com! Aw, thank you so much! This was most definitely unexpected. *sniffle* It's a small victory for the novelty poets of the world. Improbable nothing! Your Spaiku deserves every award it gets. And some it doesn't. And a few that haven't even been invented yet. Ugh! Hope you feel better soon! *lol* Thank you so much, sweetie. I very much appreciate your vote of confidence, and I'm thrilled that you've been enjoying the Spaiku. Hurrah! I was tickled pink to see the Spaiku beginning to win the awards it so richly deserves. Thank you! I was surprised, but, I confess, not unpleasantly so. And thanks so much for all the wonderful Seasonal Spuffy feedback, too! I've been away from the computer for a couple of days and haven't made it back to answer it yet. Oh, well done! Congratulations, a very richly deserved award! Awwww, you haiku'd for me! Thank you! *lol* And I'm thanking the bourbon, too. It's a talented liquor. Well done! You thoroughly deserve your pretty. Thank you very much! I was pleasantly surprised to find that the good people at Fang Fetish would tolerate the inclusion of novelty poetry in the ficlet category. Congratulations, and very well deserved. Congrats on the pretty! :) Sorry about your cold. Not a good way to lead into your [semi?] vacation time. Thank you! I was most pleasantly surprised. I'm happy to report that I finally seem to be sounding a little less like Babe, so maybe I'm on the mend. *knock wood* It seems that the students manage to give me some parting virus before they scatter to the winds at the end of every semester. *nods* Yep, semi-vacation; I have to work a few hours a week, but it's next to nothing in June and July. Woot! Hope all is well with you. I shiftily admired your beautiful yard pics at work yesterday but was interrupted before I could comment.